Lekar Hum Deewana Dil promoted on Entertainment Ke Liye Kuch Bhi Karega. 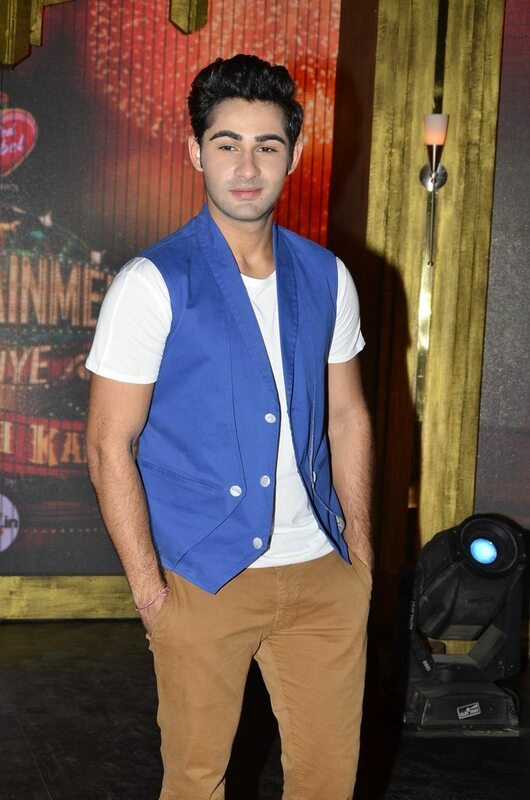 Bollywood’s newbie pair Armaan Jain and Deeksha Seth arrived on the sets of the TV show ‘Entertainment Ke Liye Kuch Bhi Karega’ to promote their upcoming movie ‘Lekar Hum Deewana Dil’. The duo looked color coordinated in blue, Deeksha stunned in an azure blue dress while Armaan sported a casual look in brown trousers paired with a cool blue jacket. The movie is jointly produced by Eros International and Illuminati Films and is directed by Arif Ali – Imtiaz Ali’s brother – for whom it will be a directorial debut. ‘Lekar Hum Deewana Dil’ also stars Sudeep Sahir, Nikita Dutta and Akhil Iyer. The film’s music has been composed by the Oscar music maestro A.R.Rahman and is all set to hit the theaters on July 4, 2014.